One of the most revered of all Hindu temples, Pashupatinath lies near the city of Kathmandu. One of most popular Hindu pilgrimage sites in the Indian subcontinent, the Pashupatinath temple is located in Kathmandu, Nepal on the banks of the Bagmati River. The temple is associated with centuries of ancient history and culture that amazes all who visit the temple for pilgrimage or tourism. The Hindu supreme deity, Lord Shiva is the primary deity worshiped at this temple. Several legends are associated with the establishment of the temple. According to one legend, Lord Shiva had once taken the form of an antelope and was prancing around in the forests of the region. The other gods, in their attempts to bring back Shiva to his usual self, tried to capture the antelope. In their attempts, a part of the antelope’s horn broke down and got buried in the ground. Years later, a cow of one of the herdsmen in the region started drenching the earth, in the place where a part of Shiva was buried, with her milk. When the earth in the area was dug, a Shiva lingam (representative symbol) was discovered. This divine part of Lord Shiva became the subject of worship and soon a temple was established in the area. Another legend claims that the temple was built by a Linchchhavi King, Supuspa Deva, a devout worshiper of Lord Shiva. A third legend also exists regarding the origin of the Pashupatinath temple. It claims that Lord Shiva and his wife, Parvati, both were so fascinated by the natural beauty of the Kathmandu Valley that they decided to transform into deer and prance around in the pristine forests of the region. As Shiva’s absence started creating trouble in heaven, all the other God’s started persuading him to return back to his original divine form. Though Shiva finally yielded, he was so enchanted by the beauty of the place where he spent time as a deer that he declared himself as the “Pashupatinath”, the Lord of all animals. He also made it clear that all who would arrive at the divine site from then on, praying to him with a pure heart, would be free from being born in the animal form. There is a lot in store for tourists visiting the Pashupatinath temple. The main building of the temple is built using the Nepalese pagoda architectural style with a two-tiered roof made of copper layered with gold. At the top, the temple bears a spire made of solid gold. Though non-Hindus are not allowed inside the main temple or the inner sanctums of other temples, they can wander about anywhere else in the temple complex. The ascetics in the complex are usually tourist friendly and, with their interesting attire, are often photographed by foreign tourists and photographers. Tourists are also allowed to witness the Hindu cremation ceremonies on the eastern banks of the Bagmati River. Since Pashupatinath is regarded as the Lord of All Animals, deer and monkeys are allowed to roam fearlessly in a nearby deer park and the temple grounds and no harm is inflicted upon such creatures by anyone. Tourists, however, are advised to keep their valuables hidden from the eyes of the mischievous monkeys in the area. Other unique sights at the temple include the Dharmashila, a sacred oath taking stone, an imposing statue of a giant bull, a four-faced statue, and several small and large temples. Since ages, the Pashupatinath Temple in Nepal has served as an important pilgrimage site for Hindus from around the world. Thousands of devotees arrive at the temple each day to seek the blessings of Lord Shiva. Special occasions at the temple witness an even larger crowd of about a few hundred thousands. On the occasion of Shivratri (the night of Lord Shiva), the temple is decorated in the best possible way with flowers and floral garlands at every doorway, passages, and balconies of the temple. A large number of ascetics arrive from all over Nepal and adjacent India, gathering at the temple grounds to worship the Lord of the temple. Pilgrims also fast the entire day, take ritual dips in the Bagmati River and pray to the God for happiness and prosperity. Another special occasion celebrated here is the Teej festival which is primarily attended by women who arrive at the temple, usually draped in red sarees, to pray for a long and happy married life with their partners. The Pashupatinath Temple is one of the many tourist destinations located in the picturesque Kathmandu Valley. Tourists visiting the temple can make extensive arrangements to tour the city of Kathmandu with its numerous tourist destinations. Other famous temple complexes near the Pashupatinath include the Boudhanath and Swayambhunath temples. The Durbar Square of Kathmandu is the palatial residence of the country’s royal family. Monasteries, museums, ethnic shopping complexes and the Langtang National Park with its unique flora and fauna are some of the other tourist destinations in and around the Pashupatinath Temple. The valley in which the temple complex is situated is surrounded on all sides by the gigantic, snow-clad mountains of the Himalayas. Hindus believe that the Pashupatinath temple is indestructible since it’s the abode of the supreme deity, Lord Shiva, who is responsible for the destruction of world himself. When the 2015 Nepal earthquake left the buildings of the temple complex virtually unscathed while other buildings in the vicinity crumbled down, the devout Hindus believed it to be a divine miracle. 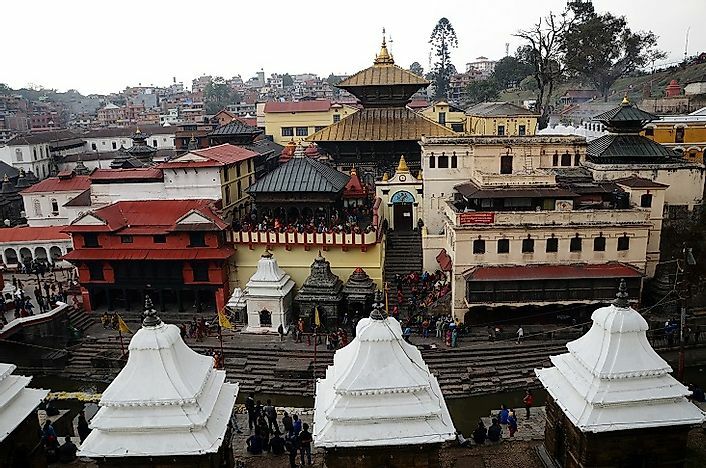 Currently, the temple complex is well-maintained by the Pashupati Area Development Trust. The popularity of the temple in the Hindu world and among international tourists and its high revenue generation capacity, motivates the Nepalese government to repair and renovate the temple buildings on a regular basis to maintain its popular status.